Spectrum Surgical's On-Location Case Cart Repair Services include major and minor welding capabilities, bumper replacement, door stops, hinges, nuts and bolts replacement, latches and more. Spectrum Surgical is pleased to offer On-Location Case Cart Caster Replacement. 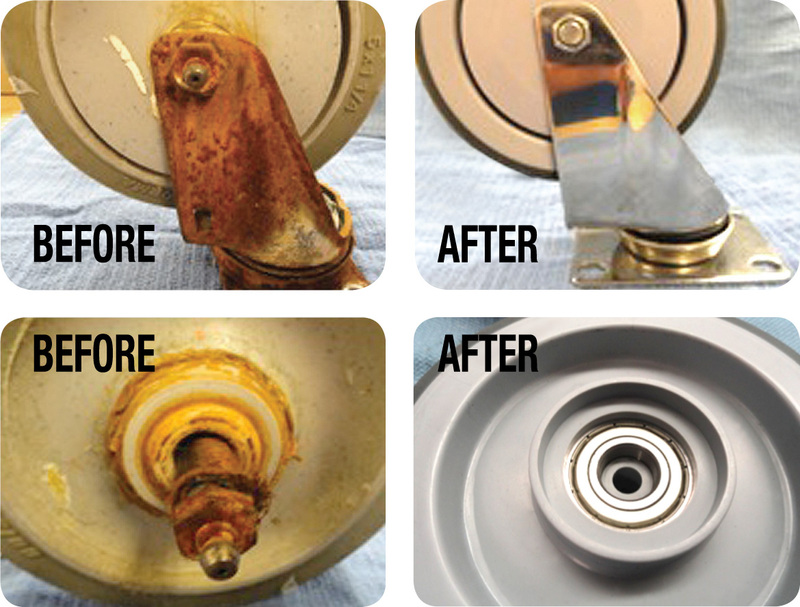 Replace rusted case cart wheels with Spectrum’s medical-grade replacement casters. Spectrum’s replacement wheels feature stainless sealed bearings and hub assemblies, and are able to withstand the rigors of repeated exposure to case cart washers. In addition, Spectrum’s On-Location Case Cart Repair Services include major and minor welding capabilities, bumper replacement, door stops, hinges, nuts and bolts replacement, latches, shelf replacement and all adjustments. Only stainless steel replacement parts are used. Any make, any model. Spectrum Surgical offers a variety of surgical instrument repair services. Please contact a customer care representative at 800-444-5644 for more information.